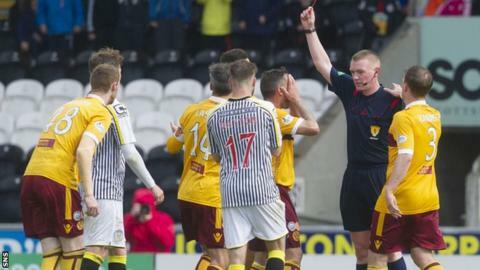 Motherwell have appealed against the red card shown to Scott McDonald in Saturday's 2-1 defeat by St Mirren. With the scores level in their Scottish Premiership match, the Australian, 31, was ordered off for violent conduct after a challenge with Thomas Reilly. "I am massively disappointed as it was a poor decision in my eyes," manager Ian Baraclough told the official Motherwell website. "Scott's absolutely not that type of player." The Steelmen went on to lose a late goal by Stephen Mallan that condemned the Fir Park side to the play-offs, where they will play a two-legged tie against either Hibernian or Rangers with Well's Premiership status at stake. "I saw it with my own eyes at the time and I never had any thoughts whatsoever that it would even be a foul, let alone a red card," said Baraclough. "Having watched it back again several times, I think it's fairly clear for everyone to see that he hasn't gone with any aggression or attempted to hurt the player and that's the view of the lad Reilly himself, who I was pleased to read today thinks it was an incorrect decision. "For me, it's a case of a striker doing what he should do, making his body as big as it can be to try to shield the ball. There was no excessive force used, no violence in my eyes and that is the foundation for our appeal." General manager Alan Burrows added: "Our football administrator Karen Paterson has already submitted a player reference for fast-tracking proceeding to the compliance officer, and will follow that with the relevant evidence tomorrow. "We had what I felt was a very fair and thorough experience when we appealed Stephen McManus's red card in January and I expect the same again this week."